As new fish owners, it's always exciting when first entering the fish keeping hobby. We all remember that first moment of purchasing your first few fish, super excited and rushing to get home and put the new fishes into your newly set up fish tank. And then, the sad part comes. Your fish are stressed, hiding and looking skittish. And days later, your fishes end up dying. This is a story that we all know too well. But fish keeping, even for beginning hobbyist doesn't have to be this way. Before you purchase any new fish and add them to your aquarium, it is highly suggested that your tank is set up properly and cycled so that the proper biological bacteria are established and ammonia levels are kept at bay and doesn't spike all of a sudden. Nutrafin Cycle is one product you can use to rapidly speed up the process and mature your fish tank with a good amount of beneficial bacteria. If you are in doubt, contact us and we will be happy to give you the steps necessary to make your tank livable for new fish! When you are leaving the fish store with your newly purchased fishes, be sure to keep them away from direct sunlight and in an area away from the heat. The light and temperature fluctuation will put a lot of stress on them. When you get back home, this is when the acclimation process starts. Leave the fish inside the bag at this point and let it float for a good 20 minutes so the temperature inside the bag adjusts to the tank's temperature as well. Once you finish, start to acclimate the water inside the bag with the tank's water. This way, it becomes accustomed to the tank's water chemistry. The best way is to use a clean bucket. Add the fish into the bucket with the same water it came with. Then add scoops of water (about one scoop every two minutes or so) for about 20-30 minutes or so (longer for certain sensitive species). 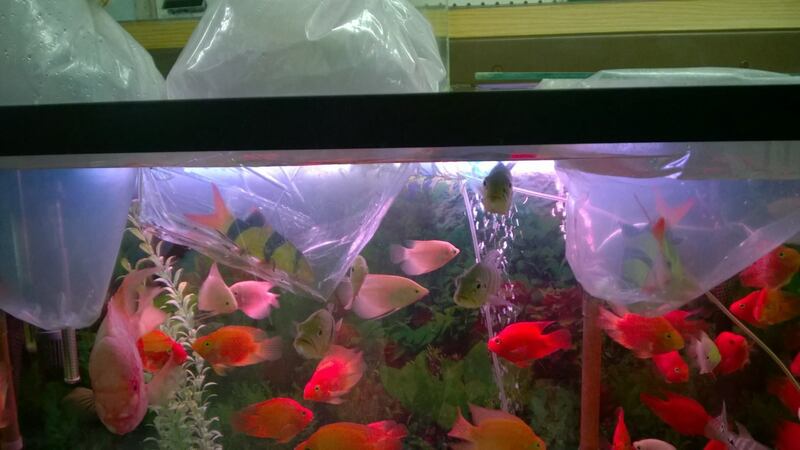 The drip method is another way to do it (recommended for sensitive fish such as Discus, etc. ), as this slowly drips once every 1-2 seconds or so. An air-tube works perfectly fine. Use a clip to keep it on the edge of the tank and another clip to the bucket and siphon it to get the water going. Adjust the drip rate by tying a knot or using a clamp or grip. Once the time passes, it is time to add the fish into your tank. Just be sure not to put the same water from the bag into the tank. This can mess up your tank's water chemistry with a ton of ammonia and potential parasites, etc. If you are in doubt with the steps and not sure if you are doing things right, give us a call or email and we'll be happy to give you the full steps.